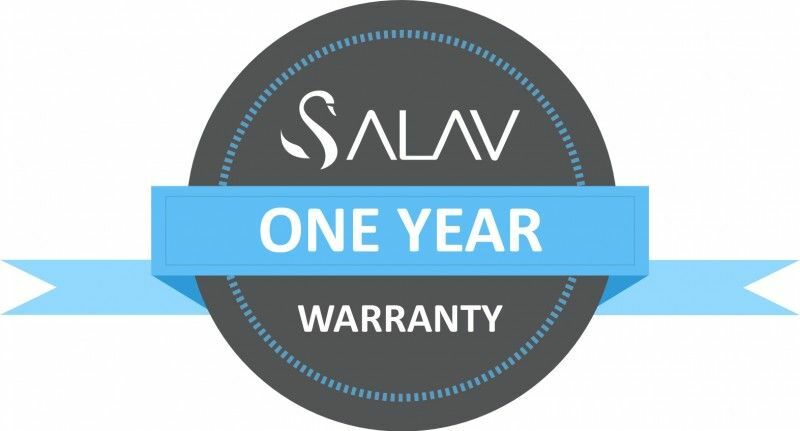 Each newly purchased SALAV product is warranted for 1 year from the date of purchase against defects in material and workmanship. During this period such defects will be repaired or the product will be replaced without charge, at SALAV’s option. If the replacement product is sent, it will carry the remaining warranty of the original product. This warranty does not cover damage caused by accident, misuse, improper operation, alteration, negligence and failure to follow SALAV’s instruction. The product is for personal and residential use only; not commercial or rental service. Warranty is also invalid in any case that the product is taken apart or repair not authorized by SALAV. If you have questions or concerns regarding your SALAV appliance, please contact our Customer Service toll-free number or submit questions via email. Please do not return any product without contacting SALAV for return authorization. Unauthorized returns and C.O.D. shipments will be refused. After receiving return authorization, carefully pack your item to avoid damage. We recommend you insure the package (as damage in shipping is not covered by the warranty). Please enclose a letter explaining the nature of the claimed defect along with proof of purchase and $9.95 for handling and return packing/shipping charges. Be sure to include your name, complete address and phone number. SALAV USA/ Capital Technology Inc.
Customers located outside of the continental US will be responsible for all international shipping charges for return or replacement items. PLEASE NOTE: If you would like to submit a WARRANTY CLAIM, please fill out the below form. For PRODUCT REGISTRATION, please register using our Product Registration form by going to the link https://www.salavusa.com/customer-care/product-registration/ or click here. Looking for a replacement part or SALAV appliance ? Visit our SHOP. Serial numbers for all SALAV products are found on the bottom of the unit ( garment steamers ) and on the back of the body of the unit ( steam mops ). The serial number is a range of numbers and a long barcode.